On Saturday evening, December 29, at 6PM, the Mother of God came to the town of Toro in Zamora region in the autonomous community of Castille and St.Leon. She was welcomed by the Norbertine Sisters, the Canonics, from the convent of Santa Sofia. This Order take their name from St. Norbert of Xanten, in Germany . They are also known as Praemonstratensians. The Community dates back to the 12th century, although they moved a couple of times before settling at Toro. They came to this old medieval mansion or palace in 1316, at the invitation of the wife of Alfonso IV of Castile, the Queen Regent María de Molina, whom they consider as their Foundress here. The Icon, accompanied by the sisters, was carried through the cloister to the convent church. The priest, presiding over the service, told the congregation about the Polish Primate, Cardinal Stefan Wyszyński who promised the Mother of God, that She would be peregrinating throughout Poland, visiting each home and each family. Today Our Lady of Częstochowa is peregrinating across the world bringing a lot of grace to those who pray to Her particularly for the defence of life and family. 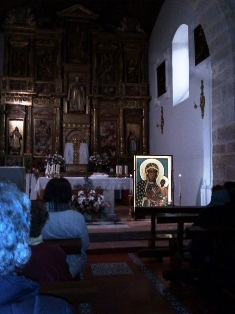 All evening and throughout the night the community of Norbertine Sisters kept vigil before the Icon of the Mother of God in the intention of successful peregrination across the world in the defense of life. On Sunday, the 30th of December, after the solemn Holy Mass the sisters first took the Icon to their place at the enclosure, and then after prayers and the blessing of the house, they carried Her in a procession to the patio where the Life Mobile was waiting to start the journey to Valladolid.